Last week, The New York Times ran a story about the current protests in Sudan and how young organizers and activists there are finding inspiration in the country’s 1964 October Revolution, which brought the military government that had ruled for six years to an end. It all began with a symposium at the University of Khartoum on October 21, 1964. When the police cracked down on the gathering, killing 20-year-old student activist Ahmad al-Qurashi, a mass nonviolent movement was sparked. 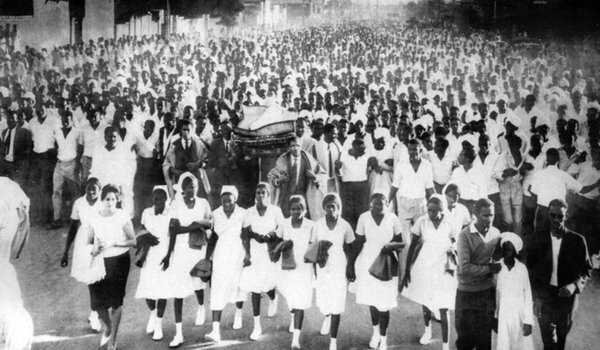 A funeral procession that was attended by thousands the following day led to a rally and protests throughout the capital. Three days into the growing uprising, organizers announced a general strike. News of the general strike spread throughout Sudan by means of telegrams, phone calls and printed leaflets—the Twitter and Facebook messages of the day. Offices, factories, shops, transportation lines were all shut down. “Suddenly, all of Sudan, what was happening in Khartoum, was repeated elsewhere, in Port Sudan, Atbara, Wad Medani, El Obeid, Kassala; it was amazing,” Mr. Ahmad said. Protests and the general strike continued to grow, challenging curfews, police brutality and army patrols, demanding the restoration of democracy. “It was too much for the government,” Mr. Turabi said. After five days of protests, 34 deaths and 153 injuries, the nation’s military ruler, Gen. Ibrahim Abbud, announced the dissolution of the governing military council. Days later, a transitional government was formed, followed by elections six months later, producing what is typically called Sudan’s second democracy. While the democratic government that followed would be overthrown in 1969 by a military coup, the October Revolution was a victory for nonviolent action that deserves to be more widely known. It also highlights an important point for all pro-democracy movements. As we’re seeing in Egypt, Yemen and the Maldives, bringing down a dictator is only the first step. Activists must not lose focus or let their guard down after the initial victory but work diligently to secure the gains that are made. Creating a truly democratic government and a new political culture are not tasks that can be accomplished overnight or are ever completely finished.